The Andrews 28 sportboat is Canadian builder Sylvana Yacht’s answer to the question “Can you build a boat that’s fast, stiff, easy to sail, and easy to trailer with enough interior space to be a comfortable cruiser as well?” It’s a question that builders have been trying to answer for years, and at first glance, the Andrews 28 may be on to something. I took a test sail off Annapolis, Maryland, to find out for myself. The hull and deck are vacuum-infused with knitted biaxial and unidirectional fiberglass, closed-cell PVC core, and vynilester resin. The keel trunk is integrated with the overall hull structure and has substantial layers of fiberglass for stiffness. Additional fiberglass and high-density foam are also added where deck hardware is mounted. The rudder is molded of carbon fiber and injected with high-density epoxy foam. The retractable keel consists of a stainless-steel strut surrounded by a fiberglass shell, and a lead bulb. The high-aspect ratio carbon foil sits in a carbon sleeve, which is mounted to solid gudgeons on the transom. This is a clever way to benefit from the simplicity and responsive helm feel that comes with a tiller controlled aft-mounted rudder, while also making it easy to retract/remove the rudder (just pull it up through the sleeve). The tiller is also built of lightweight carbon. In other respects, the deck layout is similar to what you’d find on most modern 28-foot sportboats. The transom is wide open (except for the rudder mount of course), the mainsheet and traveler controls are right where you want them, and the cockpit is big enough for a racing crew but also has backrests cruisers will like. So, the boat is fast, stiff, and trailerable. What about the accommodations? The 28’s profile may appear a bit tall when compared to other sportboats, but you can see why when you step below. There’s no hunching and hitting your head on a low-slung coachroof. The 5’10” headroom is a boon. The saloon has padded seats and several storage cubbies, and is more comfortable than some other amped-up sportboats. There’s room for two to sleep forward in the V-berth and room for two more in the saloon (good sea berths). The carbon settee table hinges up to reveal the lifting eye on the top of the keel. The galley actually has a little counter and sink, as well as a stove, and there’s even decent headroom in the head. It is perfectly comfortable for a night between races or on a weekend cruise. We had about 6-8 knots of breeze for our test sail and the boat really seemed to love the light stuff. We were cranking along at an easy 6 knots upwind without working too hard. It was easy to keep the boat in the groove and the helm was alive, just as you’d expect from a relatively lightweight, tiller-controlled boat. Tacking the 103 percent jib took the elbow grease out of grinding in a bigger genoa and frankly, we didn’t seem to need any more upwind sail area. 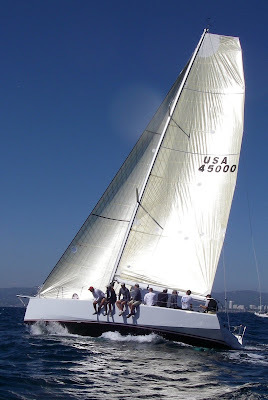 The 1,290 pound retractable bulb keel drawing 7 feet (this is how you build a boat that is easy to trailer as well as being stiff and fast) kept the boat on its feet and the sail plan hit the sweet spot between being sufficiently powerful as well as being easy to handle. The real fun happened when we turned downwind. That’s when we hoisted the 1,065 square foot asymmetric on the retractable carbon sprit and really took off. Sailing hot, tight reach angles, boat speed punched into the eights and was hovering in the 7’s; not bad for a 28 footer in hardly any wind. 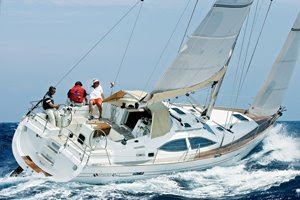 The 28 has a current PHRF rating of 94. We were having so much fun, we lost track of where we were, and then Sploosh. We bumped the bulb into the mud at the mouth of the Severn River. No problem. We just rigged the portable winch on the cabin top, fed the hoisting line through the hole in the deck, and hoisted the keel until we were free. The keel is not designed to be adjustable under way, but this little escapade shows how beefy the keel trunk is (no damage), and how useful it is to be able to lift the keel when you need to. The keel retracts until the bulb meets the hull and the hull sits flat on a low trailer and can be easily launched from a ramp. 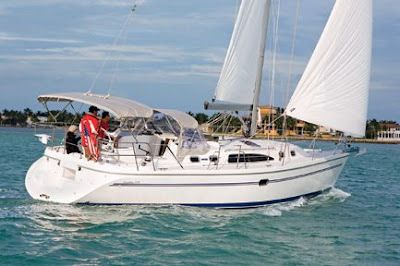 The boat has a 10 horsepower Yanmar diesel with a Saildrive unit and folding propeller. It has plenty of power to push the boat up to 7 knots, but the boat’s light air performance is so good that you may not want to turn the engine on except when the wind speed dial reads zero. It sailed like a witch in the light stuff. The lifting keel saved us lots of trouble getting off a shoal. I didn’t bump my head too much down below, and the helm has a responsive feel that brought a smile to my face. Seems like Sylvana Yachts answered all the questions they were asked. Nice looking boat, love the extra headroom it offers!